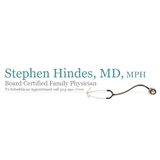 Stephen Hindes, M.D. (Englewood) - Book Appointment Online! The office of Stephen Hindes and Lily Juan is located across the street from Swedish Hospital, we have rapid access to x-ray machines and other diagnostic testing, and to specialists in the immediately adjacent medical office buildings. We practice Family Medicine. Family Medicine is a specialty of medicine dedicated to the entire family, so we see children and adults. We are trained to do an excellent job diagnosing and treating 90% of what occurs to most families and to refer to specialists as needed. She was great! I went in for anxiety and she put me at ease right away and we were able to come up with a plan to get me back to my old self!